This recipe is a slight adjustment to Nico’s classic potato gratin dauphinois recipe. 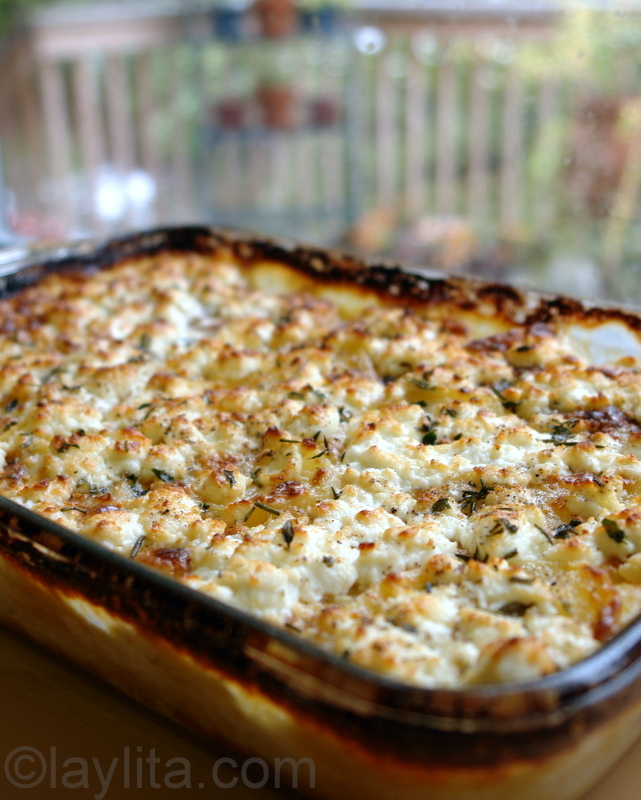 I love his gratin, actually his grandmother’s recipe, but I also love the flavor combination of goat cheese and potatoes. So, when I had some extra goat cheese and potatoes that needed to be used, I decided to put my own spin on this dish and this is the result. This dish can be made in large serving dish or in smaller molds to be served individually. Arrange potato slices in a 8×15 baking pan or in small gratin dishes, arrange the slices in a way that small spaces are left (to allow the sauce to distribute evenly). Combine the milk, 1 cup of goat cheese, whole garlic cloves, egg, and salt in a blender and mix until all the ingredients are well combined. Add the heavy cream to the blended mix and stir lightly, don’t blend the cream or the sauce will become too thick, which keeps the sauce from seeping between the potatoes. Pour the sauce over the potatoes, it should barely cover them but should seep through the layered potato slices. Bake for about 30-40 minutes, until the top begins to golden. Remove from oven, sprinkle with remaining crumbled goat cheese, ground pepper and fresh herbs. Turn the broiler on and return pan to oven, broil for about 5 minutes or until goat cheese begin to brown. Let cool for about 10 minutes before serving to allow the sauce to solidify. It looks to be worth the try! 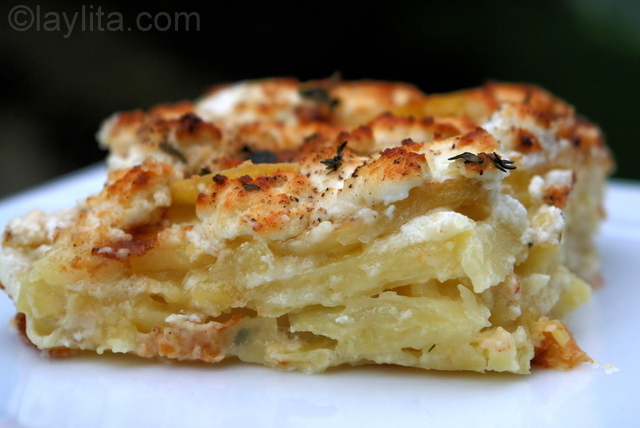 I cook the traditional gratin dauphinois but love this fun version with goat cheese. Oooh, I’ll have to share this recipe with my mother – I think she’ll love it :D ! Delicioso plato y con ese queso cottage no se me había ocurrido, buenísima la idea, tus fotos son una delicia como los platos!!! !